Architects are finding new and unique ways of using fabric because there is a not so new polymer in their tool kit: ETFE (ethylene tetrafluoroethylene). This – some say- is the building material of the future. It’s a transparent plastic, related to Teflon, and is just 1% the weight of glass, but it transmits more light, is a better insulator and costs 24% to 70% less to install. It’s also resilient (able to bear 400 times its own weight, with an estimated 50 year life span), is self cleaning (dirt slides off its nonstick surface) and it’s recyclable. 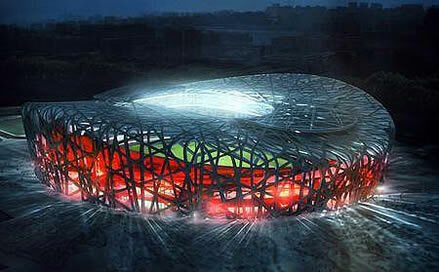 Architects started working with ETFE about 15 years ago, but the material got a boost by being used in the 2008 Beijing Olympics, where it’s an integral part of the distinctive designs of both the Beijing National Stadium (called the Bird’s Nest – see photo on right) and the Aquatics Center (the Watercube, at the left). ETFE has been described as a sturdier version of plastic cling wrap. It can be used in sheets or inflated into pillows. The 750,000 square foot Watercube is the largest ETFE project ever. It is clad entirely in blue ETFE cushions. It’s interesting to note that the Watercube is the first time the Sydney, Australia based PTW Architects, who designed the building, had ever used the fabric. They were that confident. Some bubbles in the design span 30 feet without any internal framing – a distance that wouldn’t be possible with other materials. On an aesthetic level, the cushions reinforce the building’s theme. Their pillowy shapes evoke a bubble’s roundness, and their triple-layered construction, which mixes layers of blue film with transparent film, gives the façade a sense of depth and shifting color. And there’s the fun factor: ETFE comes in different finishes and colors, and can be lit from within using LED lights or decorated with light projections like a giant movie screen as in the picture. Once the Olympics started officials were able to transform the Watercube walls into a giant TV screen showing simultaneous projections of the swimming activities taking place inside. It can take myriad shapes too: strips can be heat-welded together like fabric squares in a quilt. But what is ETFE – and what does it mean that it’s related to Teflon? ETFE was developed by DuPont, working with NASA, as a thermo plastic version of Teflon. It was designed to have high corrosion resistance and durability to hold up under oppressive cosmic radiation that NASA would expose it to. But Dr. Stefan Lehnert, a mechanical engineering student at the time, was looking for better foils for the sails on his sailboat. He experimented with ETFE and found a transparent, self cleaning, durable and very flexible material with just 1% weight of glass. It also expands to three times its normal length without losing elasticity and offers shade and insulation control. Dr. Lehnert founded Vector Foiltec in Germany in 1982, where they sold ETFE as the Texlon Foil System. Today it’s being touted as the new green alternative. Why? Using ETFE can accrue LEED points by giving you opportunities for daylighting a structure, reduction of steel for support structures, and it can save on transport costs because of its light weight. If you reduce the tonnage of steel, and reduce the raw building materials you have a real capacity to lighten up a building. The Texlon Foil System, according to the company, has low energy consumption during its manufacturing process , much of which includes recycled materials. The film itself is recyclable – the recycling is aided by the absence of additives in the manufacturing process, requiring only the ETFE and heat. 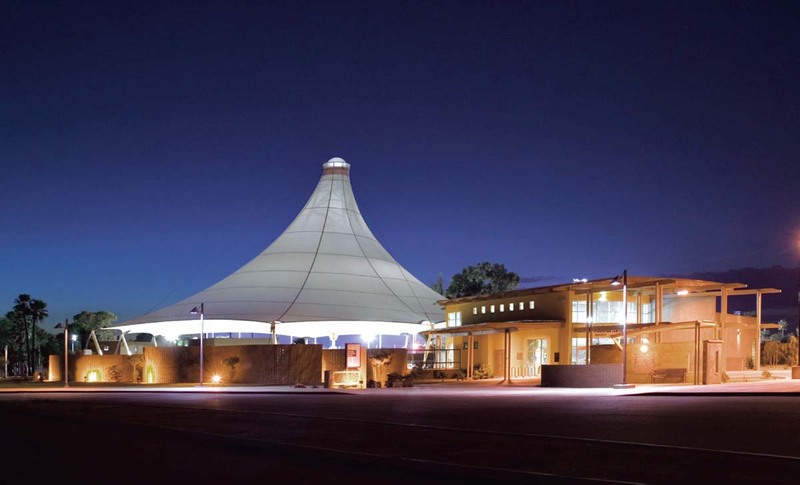 It can also be a tensile structure for renewable energy sources such as photovoltaic panels and provide shade to keep buildings cool in hot climates. Larry Medlin, professor and director of the School of architecture at the University of Arizona, says: “Fabric’s multiple capabilities from catching water, trellising plants, daylighting, and providing shade for cooling, are being looked at seriously,” he says. “Fabric can contribute to a regenerative landscape. This is important. It can’t be overlooked.” Medlin also explains that using fabric structures is one way to bring the indoor outside, as in the Edith Ball Center (shown at right), a project that required re-conceptualizing with a more innovative approach. Instead of being enclosed, the Center’s three community pools — lap, therapy and swimming — are under a dynamic, open fabric system that can be adjusted to season and climate. But what about the material itself? And is it really recyclable? There are no life cycle analyses of ETFE that I know of (please let me know if you’re aware of one and I’ll post it here) so until we know the carbon footprint issues of this product I’m still a bit skeptical, although there seem to be many points in its favor. ETFE – ethylene tetrafluoroethylene – is a fluorocarbon based polymer, aka “fluoropolymer” – a type of plastic. We did a blog posting on flurocarbons a few weeks back which can be accessed here. So the material is of the chemical family consisting of a carbon backbone surrounded by fluorine – part of the “Teflon” family of chemicals. These chemicals as a group are highly suspect, since PTFE (which is the building block for Teflon) has been found to produce PFOA as a by product. From our blog post: ” They (perflurocarbons) are the most persistent synthetic chemicals known to man. Once they are in the body, it takes decades to get them out – assuming you are exposed to no more. They are toxic in humans with health effects from increased chloesterol to stroke and cancer. Alarmed by the findings from toxicity studies, the EPA announced on December 30, 2009, that PFC’s (long-chain perfluorinated chemicals)would be on a “chemicals of concern” list and action plans could prompt restrictions on PFC’s and the other three chemicals on the list.” The Stockholm Convention on Persistent Organic Pollutants states that PFOS is used in some ETFE production. ETFE is not a derivative of a petrochemical. It is manufactured from fluorspar (CaF2), trichloromethane (CHCl3) – called chlorodifluoromethane (CHF2CL) – and hydrogen sulfate (HSO4). Chlorodifluoromethane is a raw material classified as a class II substance under the Montreal Treaty on ozone depleting substances. Class II substances are scheduled to be phased out but have a later timeline than Class I substances. The by products formed during ETFE manufacture are calcium sulfate (CaSO4), hydrogen fluoride (HF) and hydrochloric acid (HCl). The calcium sulfate and hydrogen fluoride are reused to produce more fluorspar which can be used again as in input into the manufacturing process. 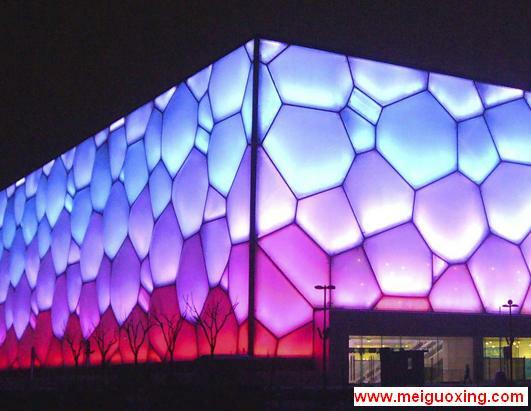 The manufactured ETFE is sold as pellets, which are then heated and extruded into sheets 50 – 200 microns thick. As one pundit has said: if this is a recyclable product, what chemicals are running off into our water supply? Do we know what those ETFE chemicals do to humans – not to mention cows, tree frogs or trees – if ingested? One thing we DO know about ETFE is that fumes given off at 300 degrees Centigrade cause flu like symptoms in humans, and above 400 degrees C – they’re toxic. (1) I have seen articles which say it is combustible and others that say ETFE is considered self extinguishing. What everyone agrees on is that in the event of a fire, the foil will then shrink from the fire source, thereby self-venting, and letting smoke out of the building. I can’t make up my mind on ETFE as a sustainable building material. What do you think? What about soil resistant finishes like Scotchgard, GoreTex, NanoTex and GreenShield – are they safe? Last week I promised to take a look at soil and stain repellant finishes to see how each is applied and/or formulated. Some of these trademarked finishes claim impeccable green credentials, so it’s important that we are able to evaluate their claims – or at least know the jargon! The chemistry here, as I said in last week’s post, is dense. The important thing to remember about all these finishes is that they all depend on flurocarbon based chemistry to be effective. 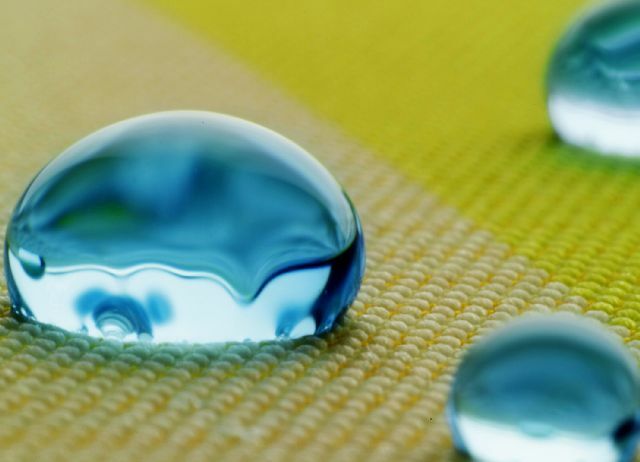 The oldest water repellant finishes for fabrics were simply coatings of paraffin or wax – and they generally washed out eventually. Perfluorochemicals (PFC’s) are the only chemicals capable of repelling water, oil and other liquids that cause stains. Fabrics finished with PFCs have nonstick properties; this family of chemicals is used in almost all the stain repellant finishes on the market today. Other materials can be made to perform some of these functions but suffer when subjected to oil and are considerably less durable. The earliest type of stain resistant finish (using these PFCs) prevented the soil from penetrating the fiber by coating the fiber. For use on a textile, the chemicals are joined onto binders (polyurethane or acrylic) that acts as a glue to stick them to the surface of the fabric. Gore Tex is one of these early coatings – a thin film was laminated onto the fabric; another, manufactured by 3M Corporation for nearly 50 years, is Scotchgard. Scotchgard was so popular and became so ubiquitous that “Scotchgard” entered the language as a verb. The chemical originally used to make Scotchgard and Gore Tex breaks down into perfluorooctane sulfonate, or PFOS, a man-made substance that is part of the family of perfluorochemicals. PFOS and PFOA have chains of eight carbon atoms; the group of materials related to PFOA and PFOS is called C8 – this is often referred to as “C8 chemistry”. If you recall from last week’s post, the PFC family consists of molecules having a carbon backbone, fully surrounded by fluorine. Various “cousins” have carbon backbones of different lengths: PFOS or C8, for example, has 8 carbon atoms, C7 has 7, and so on. There is controversy today about the so-called “bad” fluorocarbons (C8 ) and the “good” ones (C6) which I’ll address below. 1) electrofluorination: uses electrolysis to replace hydrogen atoms in a molecule by fluorine atoms to create the 8 unit chain containing just carbon and fluorine. A small amount of PFOS (perfluorooctane sulphonate) is created during this process. 2) Telomerisation: chemical equivalent of making a daisy chain: produces mini polymers by joining single units together in chains. The usual aim is to produce chains that are an average of 8 units long, but the process is not perfect and a range of chain length will result – ranging from 4 units to 14 units in length. So you can have a C4, C6, C12, etc. In this method a small amount of byproduct called PFOA (perfluorooctanoic acid) is produced. Scientists noticed that PFOS (the C8 fluorocarbon) began showing up everywhere: in polar bears, dolphins, baby eagles, tap water and human blood. So did its C8 cousin PFOA. These two man-made perfluorochemicals (PFOS and PFOA) don’t decompose in nature. They kill laboratory rats at higher doses, and there are potential links to tissue problems, developmental delays and some forms of cancer. Below are tables of results which the U.S. Environmental Protection Agency released from data collected by 3M and DuPont; some humans have more PFOA in their blood than the estimated levels in animals in this study. For a complete review of this study, see the Environmental Working Group’s website, http://www.ewg.org/node/21726. Eventually 3M discontinued Scotchgard production. Yet accounts differ as to whether 3M voluntarily phased out the problematic C8 chemistry or was pressured into it by the EPA after the company shared its data in late 1999. Either way, the phase-out was begun in December 2000, although 3M still makes small amounts of PFOA for its own use in Germany. 3M, which still monitors chemical plants in Cottage Grove, Decatur, and Antwerp, Belgium, insists there are no risks for employees who handled or were exposed to the chemicals. Minnesota Public Radio published a timeline for milestones in 3M’s Scotchgard, which can be accessed here. The phase-out went unnoticed by most consumers as 3M rapidly substituted another, less-effective spray for consumers, and began looking for a reformulated Scotchgard for carpet mills, apparel and upholstery manufacturers. For its substitute, 3M settled on perfluorobutane sulfonate, or PFBS, a four-carbon cousin of the chemical in the old Scotchgard, as the building block for Scotchgard’s new generation. This new C4-based Scotchgard is completely safe, 3M says. The company adds that it has worked closely with the EPA and has performed more than 40 studies, which are confidential. Neither 3M nor the EPA will release them. According to 3M, the results show that under federal EPA guidelines, PFBS isn’t toxic and doesn’t accumulate the way the old chemical did. It does persist in the environment, but 3M concluded that isn’t a problem if it isn’t accumulating or toxic. PFBS can enter the bloodstream of people and animals but “it’s eliminated very quickly” and does no harm at typical very low levels, said Michael Santoro, 3M’s director of Environmental Health, Safety & Regulatory Affairs. 3M limits sales to applications where emissions are low. 3M says convincing consumers Scotchgard is safe is not its No. 1 challenge; rather it’s simply getting the new, new Scotchgard out. The brand, 3M maintains, is untarnished. “This issue of safety, oddly enough, never registered on the customers’ radar screen,” said Michael Harnetty, vice president of 3M’s protective-materials division. 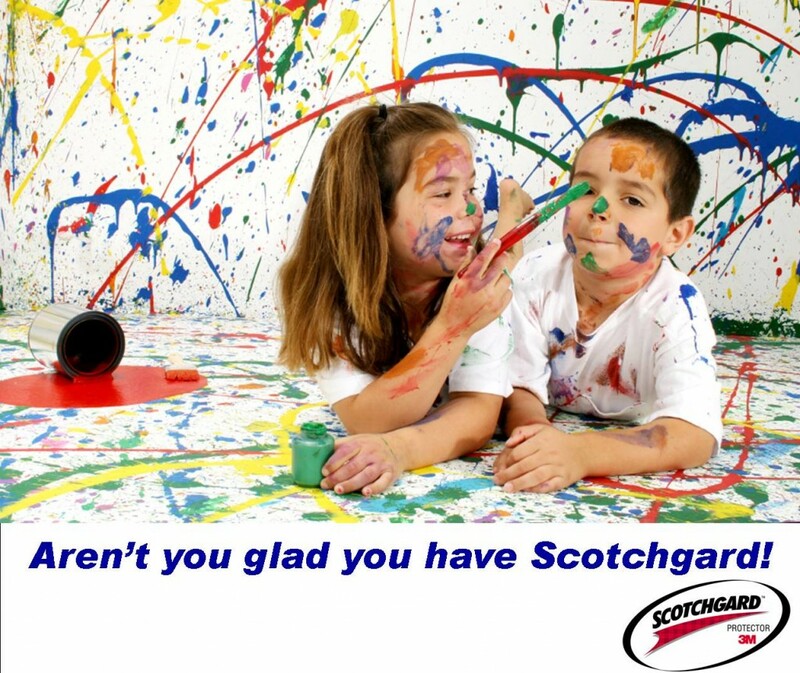 Scotchgard remains a powerful brand: “We still get really good requests like, ‘Will you Scotchgard this fabric with Teflon?’ ” said Robert Beaty, V.P. of Sales for The Synthetic Group, a large finishing house. Another early soil resistant finish is Teflon, which was produced by DuPont. Teflon is based on C8 chemistry, and PFOA is a byproduct of the manufacturing of fluorotelomers used in the Teflon chemistry. There has been a lot of information on 3M, DuPont and these two products, Scotchgard and Teflon, on the web. The Environmental Working Group http://www.ewg.org/ has detailed descriptions of what these chemicals do to us, as well as the information on the many suits, countersuits, and research studies. The companies say their new reformulated products are entirely safe – and other groups such as the Environmental Working Group, question this assumption. The fluoropolymer manufacturers are improving their processes and reducing their waste in order to reduce the amount of PFOA materials used. The amount of PFOA in finishing formulations is greatly diminished and continues to go down, but even parts per trillion are detectable. Finishing formulators continue to evaluate new materials which can eliminate PFOA while maintaining performance but a solution is still over the horizon. One critical piece in this puzzel is that PFOA is also produced indirectly through the gradual breakdown of fluorotelomers – so a stain resistant finish may be formulated with no detectable amounts of PFOA yet STILL produce PFOA when the chemicals begin to decompose. Recently a new dimension was added to stain resistant formulations, and that is the use of nanotechnology. Nanotechnology is defined as the precise manipulation of individual atoms and molecules to create layered structures. In the world of nanoscience, ordinary materials display unique properties at the nanoscale. The basic premise is that properties can dramatically change when a substance’s size is reduced to the nanometer range. For example, ceramics which are normally brittle can be deformable when their size is reduced. In bulk form, gold is inert, however, once broken down into small clusters of atoms it becomes highly reactive. Like any new technology, nanomaterials carry with them potential both for good and for harm. The most salient worries concern not apocalyptic visions, but rather the more prosaic and likely possibility that some of these novel materials may turn out to be hazardous to our health or the environment. As John D. Young and Jan Martel report in “The Rise and Fall of Nanobacteria,” even naturally occurring nanoparticulates can have an deleterious effect on the human body. If natural nanoparticulates can harm us, we would be wise to carefully consider the possible actions of engineered nanomaterials. The size of nanoparticles also means that they can more readily escape into the environment and infiltrate deep into internal organs such as the lungs and liver. Adding to the concern, each nanomaterial is unique. Although researchers have conducted a number of studies on the health risks of individual materials, this scattershot approach cannot provide a comprehensive picture of the hazards—quantitative data on what materials, in what concentrations, affect the body over what timescales. As a result of these concerns, in September, 2009, the U.S. EPA announced a study of the health and environmental effects of nanomaterials – a step many had been advocating for years. And this isn’t happening any too soon: more than 1,000 consumer products containing nanomaterials are available in the U.S. and more are added every day. And nanotechnology has been used for textiles in many ways: at the fiber as well as the fabric level, providing an extraordinary array of nano-enabled textile products (most commonly nanofibers, nanocomposite fibers and nanocoated fibers) – as well as in soil and stain resistance. For scientists who were trying to apply nanotechnology to textile soil and stain repellency, they turned, as is often the case in science, to nature: Studying the surface of lotus leaves, which have an incredible ability to repel water, scientists noticed that the surface of the lotus leaf appears smooth but is actually rough and naturally dirt and water repellent. The rough surface reduces the ability of water to spread out. Tiny crevices in the leaf’s surface trap air, preventing the water droplets from adhering to the service. As droplets roll off the surface they pick up particles of dirt lying in their path. Using this same concept, scientists developed a nanotechnology based finish that forms a similar structure on the fibers surface. Fabrics can be cleaned by simply rinsing with water. Nano-Tex (www.nano-tex.com) was the first commercially available nanoparticle based soil repellant fabric finish. It debuted in December of 2000. Another nanotech based soil repellant is GreenShield (www.greenshieldfinish.com) which debuted in 2007. Both these finishes, although they use nanotechnology, also base their product on fluorocarbon chemistry. Nano-Tex’s website does not give much information about their formulation – basically they only say that it’s a new technology that “fundamentally transforms each fiber through nanotechnology”. You won’t get much more in the way of technical specifications out of Nano-Tex. GreenShield is much more forthcoming with information about their process. In the GreenShield finishes, the basic nanoparticle is amorphous silica, an inert material that has a well-established use in applications involving direct human consumption, and is generally recognized as safe and approved by the Food and Drug Administration (FDA) and Environmental Protection Agency for such applications. The use of silica enables GreenShield to reduce the amount of flurocarbons by a factor of 8 or more from all other finishes and it reduces overall chemical load by a factor of three – making GreenShield the finish which uses the least amount of these flurocarbons. The GreenShield finish gets mixed environmental ratings, however. Victor Innovatix’s Eco Intelligent Polyester fabrics with GreenShield earned a Silver rating in the Cradle to Cradle program. However, the same textile without the GreenShield finish (or any finish) earned a higher Gold rating, reflecting the risk of toxicity introduced to the product by GreenShield. Information on product availability is at www.victor-innovatex.com.